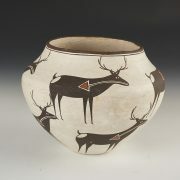 As to the meaning of this pot – “the pot itself represents Mother Earth. At the top you will see the three lines. Those are lightening along with the two black bars that are clouds. The checkerboard pattern are the three stars representing Orion. The dark shard areas are the storm clouds. The orange will always represent the sun. In the area with the fine line, is the falling rain and the four lines going the other directions are the lightning again. At the bottom, you will see the orange with an eye like pattern that is the thunderbird’s eye. 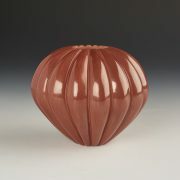 And in the pot, you will see the orange inside meaning the sun rises and at the bottom you will see the orange again – as the sun sets in the evening.” It is a wonderful first pot for us to exhibit. Franklin Peters was born into the Sky Clan on Acoma Pueblo. 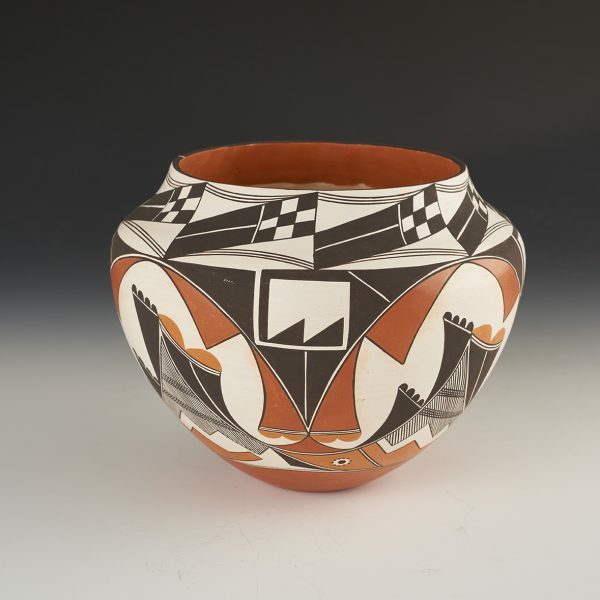 He learned the art of pottery making as he grew up surrounded by some of Acoma’s most well known potters: Ella Peters (his mother), Florence Aragon, Rachel Aragon, Phyllis Juanico, Dorothy Torivio, Wilfred Garcia, Frederica Antonio, and Barbara and Joseph Cerno. 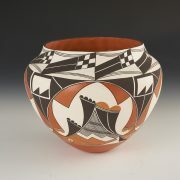 In 2011 Franklin was honored with the 2011 Rollin and Mary Ella King Native Artist Fellowship at the School for Advanced Research in Santa Fe. 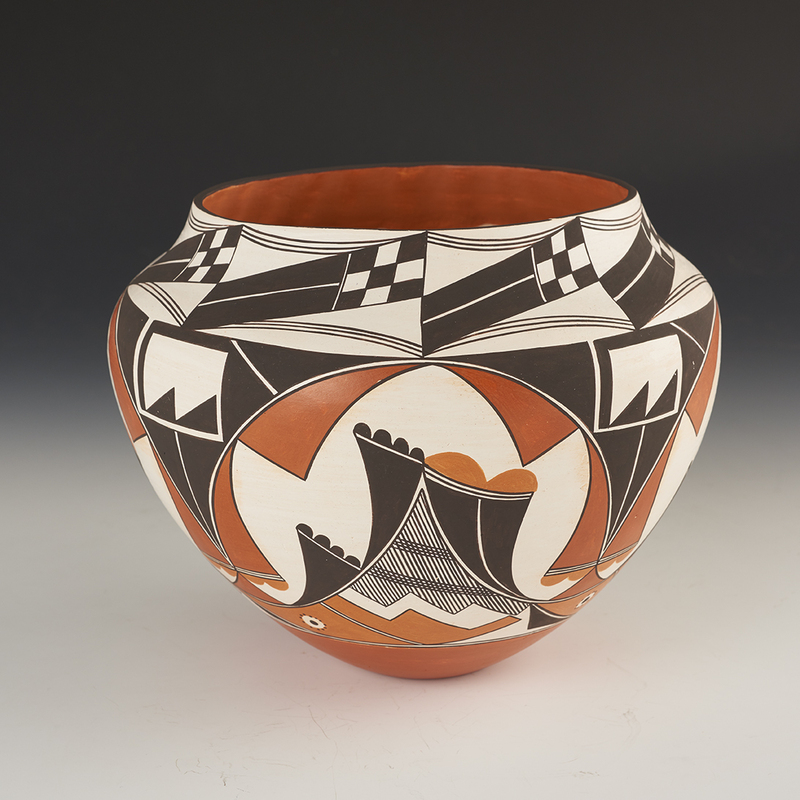 He studied the methods and designs of his Acoma ancestors and how to incorporate those methods and designs into his contemporary work. Today, Franklin’s pottery is characterized by bold slips and colors. 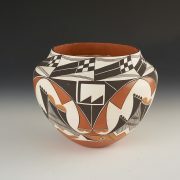 He likes sharp lines in his striking mixes of traditional and contemporary Acoma and Laguna designs. Being from the Sky Clan, Franklin says he is always praying for rain. On his pots, the thin fine lines symbolize rain and those constant prayers.